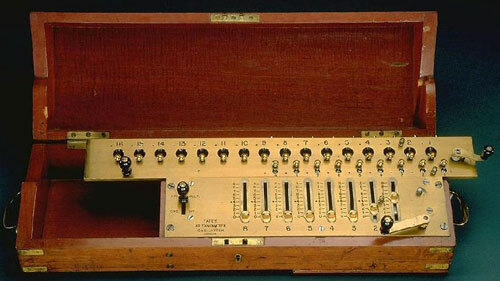 The first English stepped drum machine (Thomas de Colmar-type arithmometer) was devised in early 1880s by Samuel Tate (1840-1917), an iron worker and mechanical engineer from Sedgley, Staffordshire. Tate made some improvements in the construction of the Colmar's device and patented his improvements (UK patent №65, 1 January 1884). In 1883 the brothers Charles and Edwin James Layton, booksellers and authors of insurance books, exhibited the first arithmometer as the agents of Tate and soon afterwards acquired the patents, arranging a manufacturing workshop on Farrington Road in London. 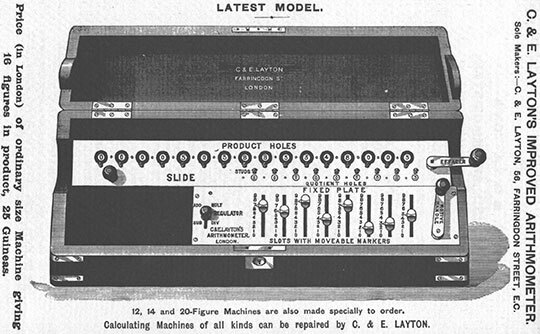 Tate-Layton's machines are generally considered to be the heaviest duty and best made of all of the late 19th century arithmometers. They were primarily manufactured for use by the insurance industry. Production of the device continued until 1914. The machine is very similar to the machine of Colmar, with overall dimensions: 16.5 cm x 63.5 cm x 19 cm, and was manufactured by brass and wood (mahogany), with removable handle. The machine has a brass top and metal mechanism and fits into a mahogany case. Six (or more, e.g. eight, as it can be seen on the lower image machine) levers are used to set digits, with a stepped drum below each lever. The plate that covers the drums and top of the machine has slits in it to allow these and other parts to move. 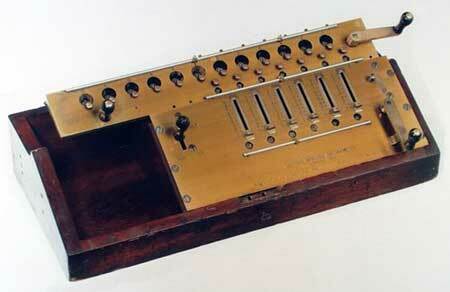 The edges of the slits next to digit levers are numbered from 0 to 9 to indicate the digit entered. An ADD MULT / SUB DIV lever is left of the digit levers, but the machine has no windows to show the number set up. The crank on the right side operates the machine. Behind the levers moves a carriage with a row of nine windows for the revolution register and a row of 12 (or more) windows for the result register. The discs in the revolution register have the digits from 1 to 8 in red and from 0 to 9 in black. The discs of the result register have only the digits from 0 to 9. Rotating the crank on the right side of the carriage zeroes these registers. A handle for lifting the carriage is on its left. Three brass decimal markers fit in holes between the levers and windows. Thumbscrews in the revolution and result registers can be used to set numbers. Handles at both ends of the case assist in lifting.